Page Master Designs Online: A Gift for YOU! Hello everyone! Today I am playing along with the Wednesday Challenge Blog over at Simon Says Stamp. This weeks challenge was to create your own background...and you couldn't use patterned paper to do it. I had been in the middle of playing with the December Simon Says Stamp Card kit and decided to use the stencil from it and a white Gelly pen to create my background. I placed the snowflake stencil at various angles on the red cardstock and traced it. It was so simple and so fast. I also traced the same snowflake stencil on white cardstock and covered it in Martha Stewart glitter. I die cut the gift card holder from a PaperTrey ink die and some Bella Blvd. paper. The little penguin is from Purple Onion Designs, colored in with Prismacolor Pencils.. A Gift for you is Hero Arts. I made 12 cards last week. I will be back to share more soon. Have a wonderful Monday. 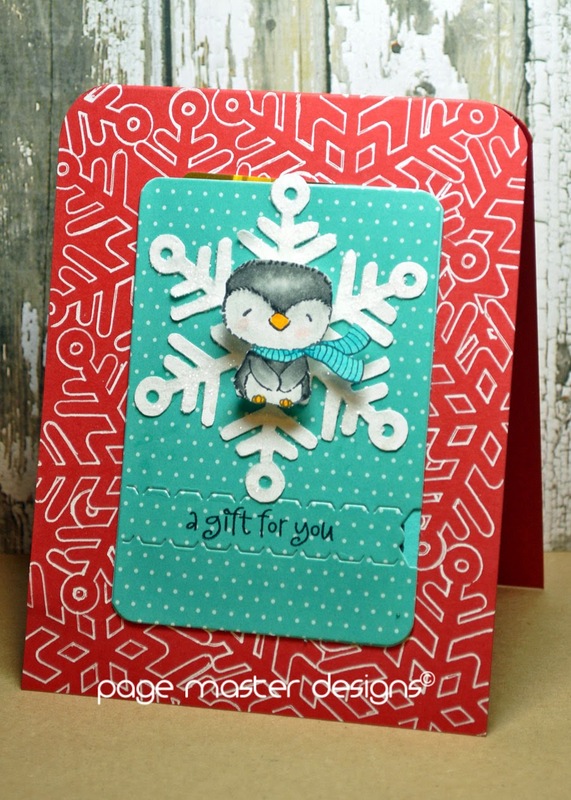 Gorgeous card Michelle, super cute penguin and your stencilling looks fab. All images on this site are owned solely by the author of this blog. No images my be reproduced.. Powered by Blogger.